Is there anything sweeter than baby feet? 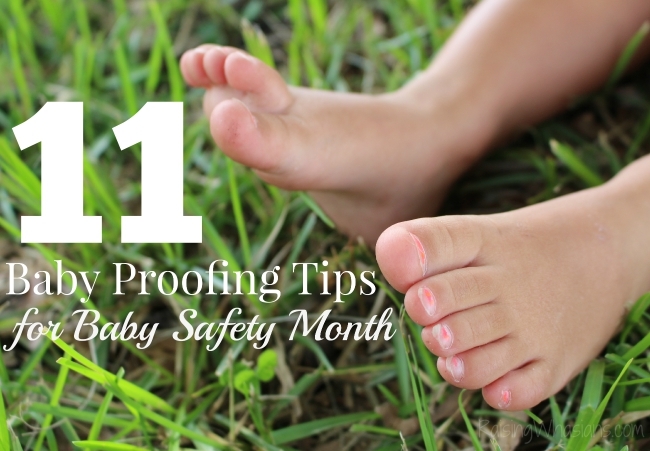 September is Baby Safety Month, an important time for us to go over and reinforce some really important safety tips for you and your little ones. 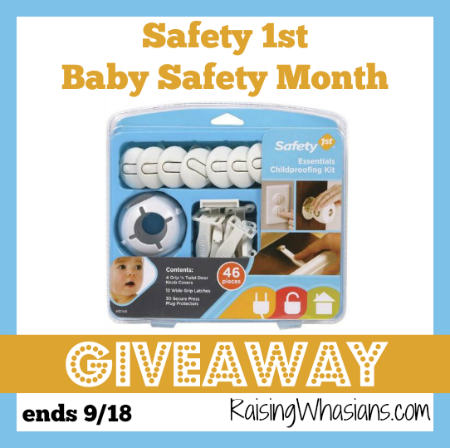 Here’s 11 Baby Safety Month Tips for Baby Proofing and be sure to scroll down for a Safety 1st Giveaway! Baby safety is NOT something I take lightly. When you go through traumatic baby experiences like I have (see My Theme Park Nightmare) you look at the safety of kids, especially my kids much differently. Baby proofing is essential to the safety of my daughter, and this post is definitely something that moms of little ones should read. Let’s make sure that we are covering all angles of house safety during Baby Safety Month. Outlets, drawers and sharp corners. Many of the hazards in your home are below your knees and directly within a little crawlers reach. Getting down on your hands and knees to view your home from your child’s perspective is a great way to begin childproofing. Seeing the world from their view can give perspective to the potential hidden dangers in your home. Whether it’s the kitchen or the play room, sharp corners are inevitable. Soften the edges with Foam Edge Protectors or an Expandable Table Edge Bumper from Safety 1st. Outlets are another danger at eye level with your little crawler. Outlet plugs are an easy and effective way to avoid electrical dangers. Pay close attention to the cupboards that are the easiest for your crawler to open and make sure the items in that cupboard are safe for your child to play with – if not make sure you put a lock on it. New climbers bring home safety checks to a whole new level. While we pass quickly through hallways and stairwells, they are a climber’s favorite place to play. A climber has to climb! It’s OK to teach your child how to climb the stairs but she should only do so when you’re right behind her, every step of the way. At the top of the stairs, always use a gate that can be installed with hardware, rather than a pressure fit gate. For the bottom of the stairwell try Safety 1st’s Lift, Lock & Swing Gate. Also, make sure to move potentially dangerous items out of reach, especially in the kitchen and bathroom. Keep toy bins away from a window. Children will find a way to climb on top of the toy bin or stack toys on top of one another to look outside. According to the U.S. Consumer Product Safety Commission (CPSC) one of every three children required hospitalization after falling from a window. Secure TVs and furniture to the wall using Safety 1st Furniture Wall Straps to prevent tip-overs. These kinds of accident happen more than you might think so take a few minutes, secure your TV and furniture, and then never worry about it again. From kitchen appliances to bathroom cabinets, the on-foot explorer loves to find trouble anywhere it is available. Walking toddlers call for undivided attention at all times – or locks, latches and covers of all sorts. Ovens and stoves are hot and can burn your child. It is a good idea to use the back burners of your stove whenever possible and remember to turn pot and pan handles in, and away from the edge of the stove. Reinforce with your toddler that the oven is hot and he or she should not touch it. Cabinets and drawers contain many hazards, such as cleaning supplies, plastic bags, breakable and sharp objects, and food that can be a choking hazard. Be sure to lock all cabinets and drawers to keep your child away from the contents. Multi-Purpose Appliance Locks and Press ‘n Pivot Latches are great for keeping hazardous items out of reach. Exploring is good but some adventures shouldn’t be taken without a parent. High Door Locks help keep on-foot explorers from wandering into unwanted areas. To get started on childproofing your home this month try the 46 piece Essentials Baby Proofing Kit. from Safety 1st. And don’t forget to follow Safety 1st via Facebook and Twitter for the latest safety products for your little ones, tips and more! 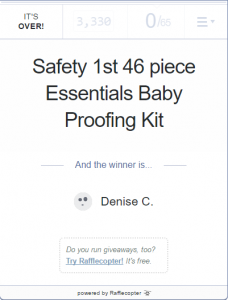 I’m so thankful to Safety 1st for sponsoring this giveaway. Raising Whasians is not responsible for shipment of prizes. 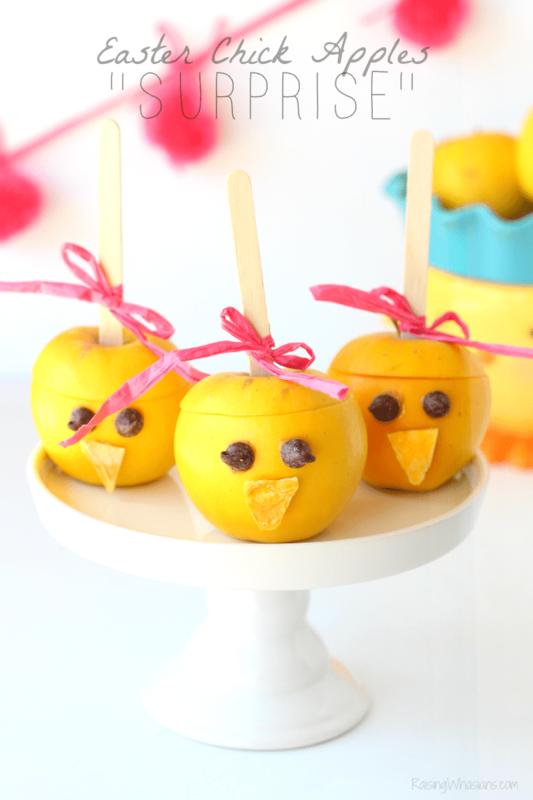 Be sure to follow Raising Whasians via Facebook, Twitter, Google, Instagram, Pinterest and YouTube for kids craft ideas, easy family recipes, travel memories, giveaways and more! I think using the back burners on the stove is a great tip! my best tip is don’t forget to be very careful where you put the pet food and water dishes. they should not be near where the children are. The reminder on sharp corners especially is very important and a good reminder. As a teen, I had some major surgery which made me bump into cormers dangerously too often, and we had to even put safety to all corners. For little ones, since we are taller and forget more about the lower corners. I think it’s important to get down on a little one’s level to see all the dangers from their perspective. My baby-proofing tip: Install baby proofing equipment well before you actually need it. When they start being mobile, you won’t have as much time to set things up. Also, children can move faster, reach farther, and climb better than you expect. Have dangerous items out of sight, way up high and/or locked up. Bookshelf,TV, and dresser anchors! Those are things I wasn’t even aware of until recently. Don’t ever under estimate the little ones. They will put things in their mouth that you would never dream of eating. LIke bleach, laundry pods or shoe polish. Put it up, up and away! Mine is pretty simple….. Use door latches and outlet covers. You can never be too safe. Get down on their level. Also, don’t assume that just because you think things are safe, you don’t have to watch them all the time. Some how they always seem to figure out how to do things they should not do or get into. Never take your eyes off them! And if you have to do something where you can’t devote full attention to them, try to corral them in something! Leave the door closed to any room you don’t want baby to get to- once they start moving, they are everywhere! My favorite is the outlet covers. The high door locks are pretty convenient. That is exactly what we need. My favorite tip is to cover the outlet sockets. Securing the furniture. I really need to do that soon! ALWAYS keep the toilet seat down! We are expecting our first so I have a lot to learn. But just based on having a puppy, I guess I would say never leave them unattended and make sure you block off any areas that you don’t want them in. Anchor furniture and televisions to the wall. Cover the outlets early so they will think it is normal and no be drawn to them. Make sure to keep bathroom doors closed! Don’t leave cords hanging where child can grab and pull something down on them!! Locking the cabinets with cleaning supplies is a great tip. We’ve found locking drawers important to prevent climbing too. Keep cleaning supplies out of reach! Not to put the toy bin under window.